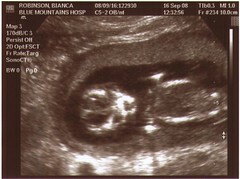 It's finally official - Hairy Mountain Folk are brewing up a tiny pair of hairy mountain feet! After having our first ultrasound this Tuesday, we got our first glimpse of The Sprout, who kindly gave us a little wriggle on the screen just so we knew it was alive and kicking. It's all rather exciting/surreal/freaky/wonderful ... I'm sure like all new parents, we're not going to know what's hit us, but for the moment we're enjoying blissful ignorance! Phil has very nobly suffered through two months of me whingeing on a daily basis about how sick I feel and how I simply MUST have Indian food today and 'don't you dare come near me with those porcini mushrooms'. Yep, all-day hangover is about the kindest description I can come up with. Even more upsetting is I have gone off porridge and oranges - my previous desert-island-foods. Haven't gone off chocolate though ... heh heh heh. As a woman who likes to keep herself looking presentable (and that covers spending all day in a dressing gown and ugg boots), I was relieved to discover that 'maternity wear' does not mean 'muu-muu', and have actually managed to deck myself out in some decent stretch-waisted outfits. In fact, they're so comfortable I could quite happily see myself spending the rest of my life wearing stretch-waisted outfits. Yayyyy, congratulations to you both!!!! What great news! When is he/she due? You poor thing with morning sickness, no fun at all. Mine improved with each baby, but that's not much of a remedy for you right now is it? The only thing that helped me is to eat small portions of non-fat food very often, don't let your tummy get empty. You've probably figured that one out already! Those sea-sick wrist bands are also worth trying.